The Eden Trace Viewer is a tool designed to help programmers optimize Eden programs by visualising traces (eventlog files) of Eden program runs. 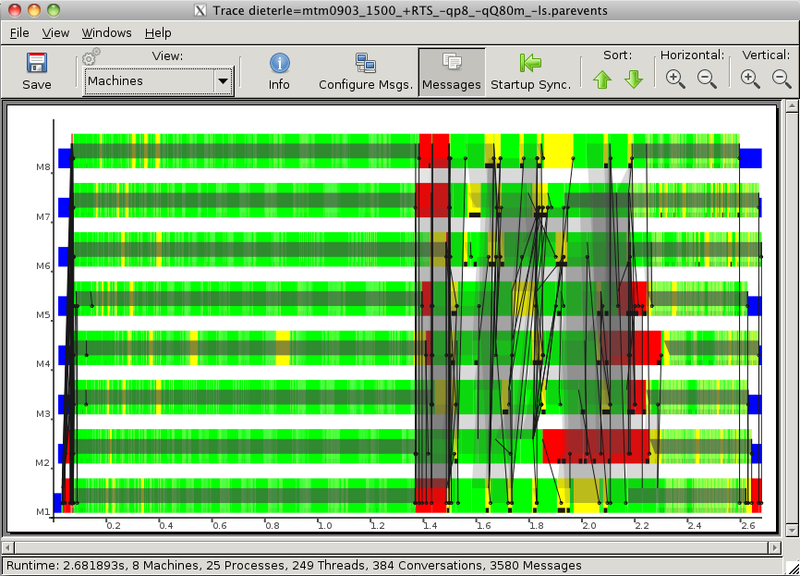 It is similar to (and precedes) threadscope. However, it has been designed to visualize not just threads, but also different machines, processes, and messages between processes. EdenTV can show you what has happened during the execution of your program. This is very helpful to optimize parallel programs. Eden, combined with Evaluation Strategies, can give the programmer control over the evaluation order and interaction of the processes in an Eden program. EdenTV provides an insight of the execution and gives you hints about which part of your program does not work efficiently. EdenTV is conceived for post-mortem analysis and uses an instrumented Eden Runtime System. When tracing is activated (by a special compile Flag and RTS option), the Eden Runtime System creates trace files during the execution of the compiled program. After the execution of the program the trace file is ready to be analyzed by EdenTV, which creates several diagrams and displays related information. We currently ported the Eden Trace Viewer to process the GHC's new eventlog format, which we extended with specific Eden events. The new version does not support the SDDF format which we used for tracing in older compiler versions. The Eden Trace Viewer is available in our download section.